[April 14, 2007] MOUNT PULASKI -- Reva M. Holmes, 73, of Mount Pulaski died Thursday, April 12, 2007, at 1:50 p.m. at Vonderlieth Living Center. 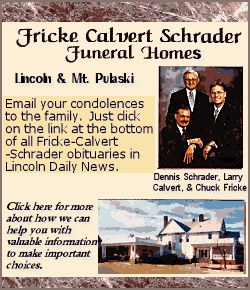 Visitation will be from 1 to 3 p.m. Sunday at Fricke-Calvert-Schrader Funeral Home in Mount Pulaski. Her funeral will be at 10 a.m. Monday at the funeral home, with Bill Shanle officiating. Burial will be in Steenbergen Cemetery. Mrs. Holmes was assistant cashier at the First National Bank in Mount Pulaski for many years. She was born Sept. 16, 1933, at Parnell to Dallas and Adeline Wilson Bristow. She married Kenneth Martin Holmes in Mount Pulaski on Aug. 15, 1954. She is survived by her husband, of Mount Pulaski; two sons, Marty Holmes of Lincoln and Kevin (and Tammy) Holmes of Bloomington; one daughter, Karen M. Heaton of Farmersville; two sisters, Lois Miller of Witt and Virginia Banister of Lincoln; four grandchildren, Amy Holmes, Alexandria Holmes, Samantha Holmes and Cecilia Holmes, all of Bloomington; and many nieces and nephews. She was preceded in death by her parents, five brothers, one sister and a son-in-law, Shane Heaton. 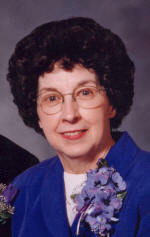 She was a member of Mount Pulaski First United Methodist Church. Memorials may be made to First United Methodist Church of Mount Pulaski, Vonderlieth Living Center and Wayne J. Schahl Hospice of Lincoln. Click here to send a note of condolence to the Holmes family.